On the outside a Chioggia (kee-oh-jah) looks like any common beet. But slicing it crosswise reveals a gorgeous red & white bull's eye. This heirloom variety dates back to the mid- 1800's and has a sweet, mild flavor that makes it extra versatile. Sow seeds in rich, well draining soil in full sun. Space seeds about an inch apart and cover with 1/4" compost. To grow in a garden planter, choose a container that is at least 8" deep and wide and fill with fresh potting soil. 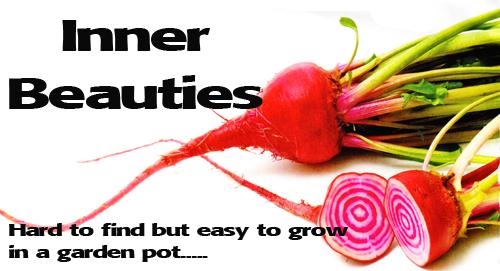 Keep soil moist but not soggy, and feed beets lightly with an organic fertilizer when tops are a few inches tall. Pull up the potted beets when the tops of the roots are 1 to 3 inches across, usually about 50 to 60 days after planting. Store beets in the vegetable drawer for up to 2 weeks. Peel before using raw or after roasting. 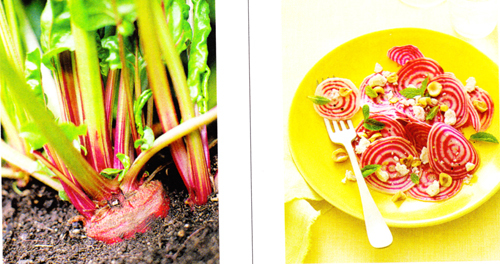 In a salad: Shave raw beets paper thin with a mandolin or vegetable peeler. Toss with a vinaigrette of lemon juice and olive juice. Sprinkle with chopped hazelnuts and torn mint leaves. As a main course you can cut the roasted beets into quarters and toss with wilted spinach, olive oil and a squeeze of lemon. Top with a poached egg, freshly shredded Parmesan cheese, and pepper. If you want to eat them on the side we recommend drizzling extra virgin olive oil over cooked and sliced beets or fresh goat cheese and chopped green onion. Easy to grow, can be grown in garden planters and yummy to eat! Read more.....Create this stunning planter!